Alright let's start off by picking up where I left off last week...I was about to take my second LT test. My first test showed that I had a LOT of strength that I needed to build. So...12 weeks later..here we are again..my second LT test. I had no idea what to expect going in..I knew what I was hoping for..just a number higher than last time! Prior to my test, I did a little pre-shopping at Above Category and if I liked my test, then I was going to buy what I had picked out. Actually, I probably would have bought it regardless :-). Anyway, so my test results came in, a solid 30% increase in power! Score! Chris said he liked the results so if coach ia happy with the results, then I was as well! Oh, forget to mention, my zone 2 heart rate increased by 20 beats. Let's see how my body will adjust to that one! So now higher numbers means a tougher computrainer class. I adjusted quite well on Tuesday and Thursday, well I was just trying to hold on in class as the intervals were tough!! I had never pushed the down button faster than I did that day (down button brings wattage back to 50 for easy warm up/spin)! Onto the latter part of my week- Wildflower training weekend with the Ironteam! I was really excited about this weekend as I wanted to get an open water swim in me before Oceanside and test out my new heart rate on the bike course with my TT bike. Saturday morning, Dave woke us up at 4:55am with the music of Scottish bag pipes. Seriously, Dave! Imagine the sound of this at 4:55am! So, I've swum many times in open water with no issues, ever. I love the open water but somehow on Saturday morning, Lake San Antonio didn't like me. I swum for about 3 minutes before I felt my throat scrunch up and just couldn't breath anymore. It really sucked! After 50+ minutes of trying, hanging onto the kayak (thanks Brian) and hanging onto my friend Hez (she water jogged as I kicked), I decided to ask Brian to bring me back to the dock as I kicked behind the kayak. As I got out of the water, my eyes swelled up as well as my throat. Non-stop coughing for 50+ minutes was pretty darn awful! What did all that mean for my bike? It didn't happen! I biked about 6 miles.. stopping about 5 times since I couldn't catch my breath...bust of a training weekend!!! Highly disappointed and at a lost as to what the heck happened?! So what's next? Well, I am going to have to do the dreaded....jump into the waters of Aquatic Park to see if it was the crap that was in Lake San Antonio that caused my breathing issues or was it my wetsuit or did something mental develop? Did I mention that I had a feeling it wasn't going to be a smooth weekend as Friday was just a mess as I was heading down there. Mess included a street cleaning ticket right before leaving AND locking my keys in my car but luckily I knew where my spare was. Anyway, more to come on my open water mystery!! In the meantime, check out this picture I took while driving back from Lake San Antonio. 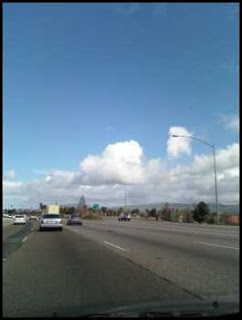 Do you see the doggie in the cloud formation?